Civilization is a product of the human mind. Of the brain. Of the head. How fitting, then, that at the core of the capital — or head — city of the United States, lies a collection of reminders and examples of U.S. civilization. The National Mall, extending along the central east-west axis of Washington, DC, reminds us through monuments of key contributors to U.S. civilization, such as Thomas Jefferson and Abraham Lincoln. The Mall also displays, inside the museums that border it, the history, art, and technology of America. Never flagging in its celebration of our achievements, the Mall is open to visitors free of charge 24 hours a day. 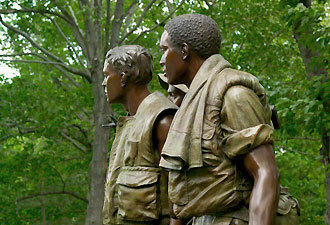 Rangers at the memorial sites are on duty to answer questions from 9 a.m. to 11:30 p.m. daily. The museums, run by the Smithsonian Institution, likewise have operating hours, which visitors should check. Eateries on the Mall are primarily snack bars and museum cafeterias, and if you tour “America's front yard” from April through October, plan for heat, humidity, and sun exposure. Parking can be difficult, so it might be more convenient and relaxing to reach the Mall on foot, by bus or commuter rail, or via bicycle. If one starts at the Capitol and walks west down the Mall, the first iconic monument one reaches is the obelisk commemorating George Washington, followed by the World War II Memorial, the Reflecting Pool (under construction until at least spring 2012), and the Lincoln Memorial. Southeast of President Lincoln and his elegant, colonnaded shelter, one finds the steel soldiers of the Korean War Veterans Memorial. Northeast of Lincoln stands the Vietnam Veterans Memorial. 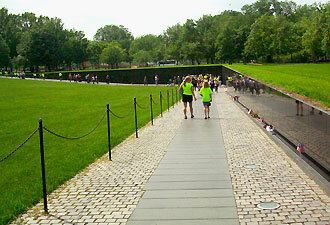 Many visitors come to pay tributes to friends or family members by locating their names on the memorial, known as “the Wall.” Others come not to seek individual names but rather to remember the Vietnam era and let the losses suffered during it sink into their psyches. 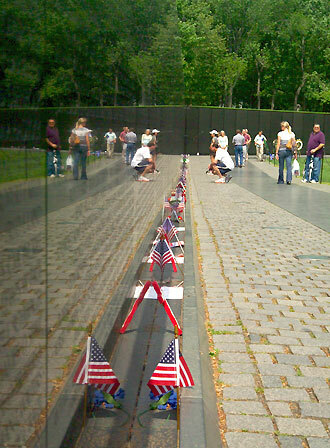 No visitor, however, can look at the memorial and the names of the dead and missing without joining their ranks by virtue of being reflected in the same walls that show their names. My own reflection – that of someone born more than a decade after the end of American involvement in Vietnam — prompts me to wonder why I happened to live too late to serve in this war. Someone who was too old to serve might also wonder. Likewise, a woman: why was I not male and subject to the draft? Someone who served: why did I survive and return? Any visitor: why did the people listed here have to die or go missing? and why is my name not among theirs? “War,” says the poet Adrienne Rich, “is an absolute failure of imagination, scientific and political.” The monuments and museums of the Mall testify to the accomplishments of human scientific, political, and artistic imagination; the war memorials testify to occasions when these imaginative forces could not prevent tragedies. These structures, and the upcoming Memorial Day holiday, provide all of us a means of thanking, and rendering homage to, our countrymen who were irrevocably affected by these tragedies.